2/Al-Baqarah-253: Of those Messengers We have exalted some above others in virtue; to some of them Allah spoke; and some of them He exalted by degrees; and We gave clear evidences to Jesus, the son of Mary, and strengthened (supported him) with the Holy Spirit. And if Allah had willed, those after them would not have killed one another after the clear signs had come to them, but they differed; so there were some of them who believed and others who denied; and if Allah had willed they would not have killed each another, but Allah does what He wills. 2/Al-Baqarah-254: O you who believe (are âmenû)! Spend (for Allah) of that with which We have provided for you before a Day (Doomsday) comes in which there is no bargaining, neither friendship nor intercession and the unbelievers-they are the tyrants. 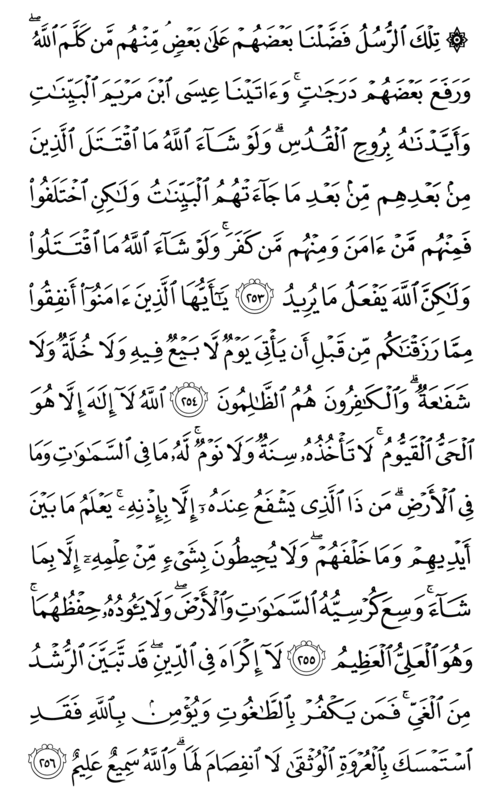 2/Al-Baqarah-255: Allah! there is no god but Him, the Ever-living, the Self-subsisting by Whom all subsist (Kayyûm); slumber does not overtake Him nor sleep; whatever is in the heavens and whatever is in the earth is His; who is he that can intercede with Him but by His Permission? He knows what is before them and what is behind them (their past and future), and they cannot comprehend anything out of His knowledge except what He wills. His “Kursî” (pulpit) extends over the heavens and the earth, and the preservation of them both (balance of the heavens and the earth) does not tire Him, and He is the Most High, the Most Tremendous. 2/Al-Baqarah-256: There is no compulsion in the Religion; truly (the Way of) Irshad (the Way of Guidance, the way that delivers to Allah) has become clearly distinct from (the Way of) “gayy” (the Way to Misguidance, the Way that leads to Satan, and Hell); therefore, whoever denies “Tâgût” (Satan and the Way leading to Satan) and believes in Allah, then he has grasped the firmest handhold (hand of religious guide), which shall not break off, and Allah is All-Hearing, All-Knowing.